1. Hooke's law, Poisson's relation, and waves along thin bars. Hooke's law and Poisson's relation. Longitudinal waves in a thin bar. Longitudinal sinusoidal waves in a bar. Hooke's law for shear stresses and torsional waves along a bar. Bending of a bar at equilibrium and bending waves.2. Basic equations of elastic waves. Equations of a motion of an elementary volume. Kinetic and potential energy and its flux. Strain, stress and Hooke's law in the curvilinear orthogonal system of coordinates.3. Elastic waves in a homogeneous medium. Spherical shear wave in a homogeneous medium. The displacement field s caused by the point force. Propagation of waves caused by the point force. Longitudinal and shear plane waves.4. Plane waves in a layered medium. Strain and stress in plane waves. Reflection at the free surface, (normal incidence). Reflection and transmission at the plane boundary of two elastic media, (normal incidence). Reflection from the free surface (oblique incidence). Reflection from the rigid surface (oblique incidence). Reflection and transmission at the boundary between fluid and elastic medium. Reflection and transmission at the boundary of two elastic media. Ray tubes and flux of energy. Reflection and transmission of plane waves in a multi-layered elastic medium.5. Surface waves in an elastic medium. Rayleigh wave in a homogeneous half-space with a free boundary. Rayleigh waves in two-layered medium.6. Waves in a layered medium caused by linear and point sources. Linear source of P and SV waves in a homogeneous half-space with a free boundary. Waves in a homogeneous medium caused by the force Fe, (two-dimensional case). Waves in a homogeneous half-space caused by force Fe. Wavefields in the far zone (linear source at the free surface). Linear source in the presence of the boundary: elastic medium and fluid. Point source of elastic waves in the presence of the free boundary.7. Propagation of elastic waves in a borehole containing a fluid. Solution of the boundary value problem. Waves in an acoustic medium. Propagation of surface waves along a borehole. Normal modes, head and transient waves.8. Plane waves in a transversely isotropic medium. Stress-strain relations in a transversely isotropic medium. Propagation of plane waves in a transversely isotropic medium. Rays and an energy flow. Phase and ray surfaces. Appendices. Appendix A. Equations of motion of a rigid body. Appendix B. Matrix algebra and tensors. Appendix C. Stress tensor. Appendix D. Deformation and strain tensor. Appendix E. Relationship between stress and strain. References. Index. 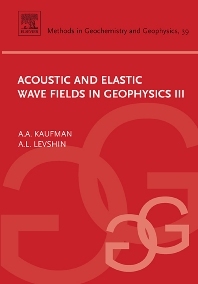 This monograph is the last volume in the series 'Acoustic and Elastic Wave Fields in Geophysics'. The previous two volumes published by Elsevier (2000, 2002) dealt mostly with wave propagation in liquid media. The third volume is dedicated to propagation of plane, spherical and cylindrical elastic waves in different media including isotropic and transversely isotropic solids, liquid-solid models, and media with cylindrical inclusions (boreholes).